Spring is in the air! 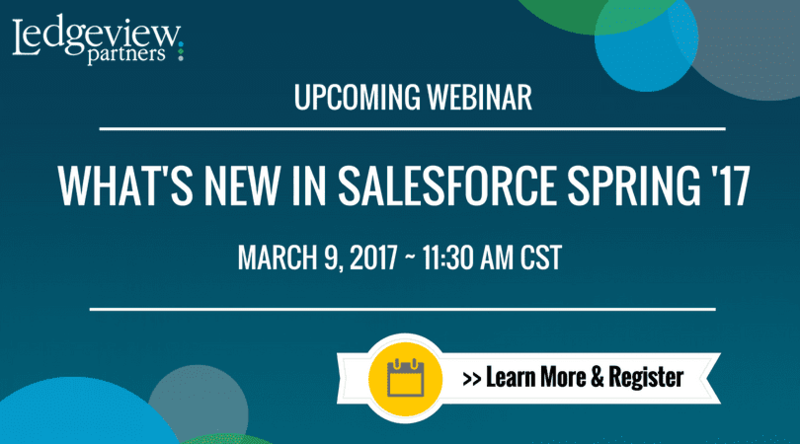 The Salesforce Spring ’17 Release is out and jam-packed with 300+ new and improved features. But what does this mean for current (and future) Salesforce Users and Administrators? What are the top features that you should make sure you are deploying and using right away. Join our Salesforce Certified Experts in this 30 minute webinar as we spotlight our favorite new features Salesforce Users and Administrators can and should take advantage of that will empower everyone to be their best. Whether you have been on Salesforce since the first release, just getting your feet wet and are a newbie, or exploring Salesforce as a CRM solution for your organization, we encourage you to invest 30 minutes in looking at many of the top new features. With 300+ enhancements in this 52nd release from Salesforce, we will also point out those that are included with your subscription and touch on which ones may come at an additional cost. 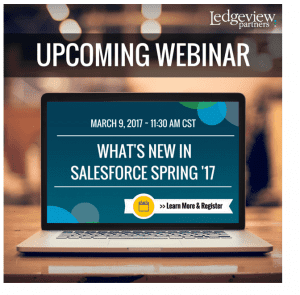 This webinar is hosted by Ledgeview Partners, a Salesforce Silver Consulting Partner. The webinar will be recorded and available on-demand for anyone that is unable to attend the live session. Simply register and we will deliver a link to your email inbox with access to watch the webinar at a time that works for you.